"I feel utterly helpless as I look at my son going through so much pain and being unable to do absolutely nothing. He is almost bedridden, he has no energy to get up from the bed, there is a sharp pain in his entire body, he throws up everything he eats and even if he talks for few minutes, he would get severe breathing trouble." Kareem, Abdul Malik’s father. 16-year-old Abdul was an active boy who spreads happiness everywhere. His teachers have always told that he is very positive and matured beyond his age. He has a lot of friends. While everyone around him was happy about his promising future, the diagnosis of his dreadful disease came as a big blow. Now his days are spent in anticipation as he worries if he would ever be able to go to college now. 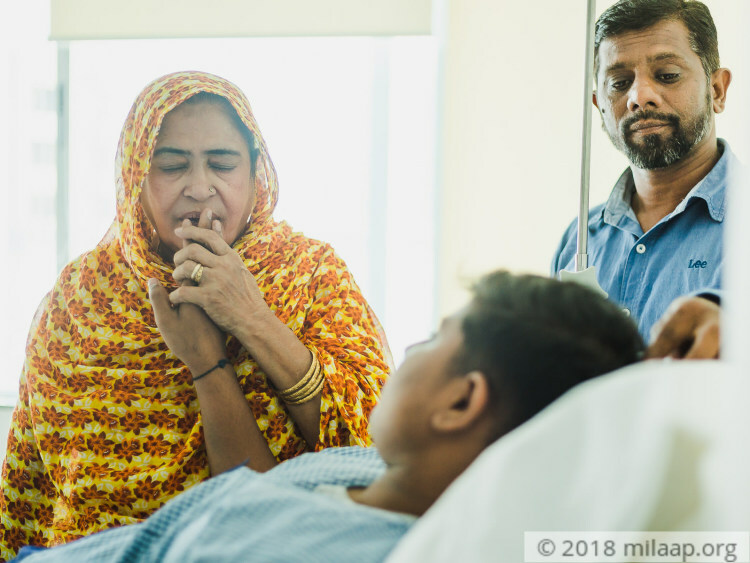 Abdul was wrongly diagnosed with tuberculosis in November 2017. He was unable to breathe normally for a medical test because there was a tumor growing close to his heart. It was only after several months had passed that Kareem learned that Abdul was suffering from T-cell lymphoblastic leukemia, a deadly form of cancer that affects the white blood cells. It occurs in the bone marrow and can quickly spread to the blood. “Suspecting TB, Abdul was given such strong medicines but his condition was not becoming any better. He couldn’t stand, walk or even lie down. Waist-down, he was in so much pain that it was literally burning him. Even his urine was red in color. Then when we heard he has cancer we broke down completely, we had no idea what to do to save him.” - Kareem. The family was shattered but Abdul was put into immediate chemotherapy hoping that he will recover soon. But fate had some other plans for Abdul. 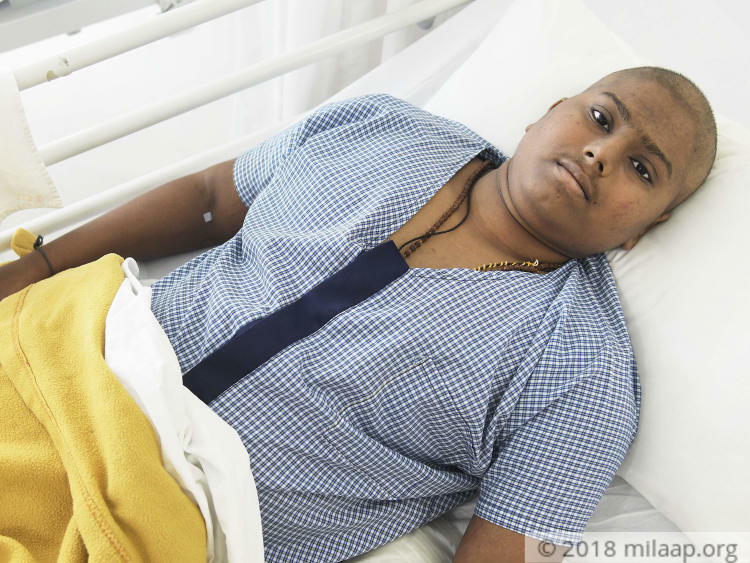 “Just two days before the completion of Abdul’s initial chemotherapy cycle, his entire body started aching so much that he could not stop crying for once. We had to rush him to the hospital and it was then that doctors told us Abdul has had a relapse. I was inconsolable and did not have the courage to face my son. When I walked up to Abdul he sensed it - he held my hands and said, ‘If I can do it once, I will do it again Abbu.” - Kareem. Abdul’s chemotherapy has restarted and it is taking a toll on his body. He can’t get up from the bed and has recurring breathing problems. Doctors have told Abdul’s family that the only way he would survive is through an urgent bone marrow transplant. “He often gets unconscious after returning from the chemotherapy sessions. We spend sleepless nights as Abdul cries out in pain and vomits out anything he eats. On such nights he just wants to lie down on his grandmother’s lap, he is very close to her. I have no words to express my helplessness as I watch my son suffer.” - Kareem. Kareem is a contract technician and earns around Rs 300 per day. He is the sole breadwinner for his family and he has not been able to go to work regularly off late owing to his son’s illness. 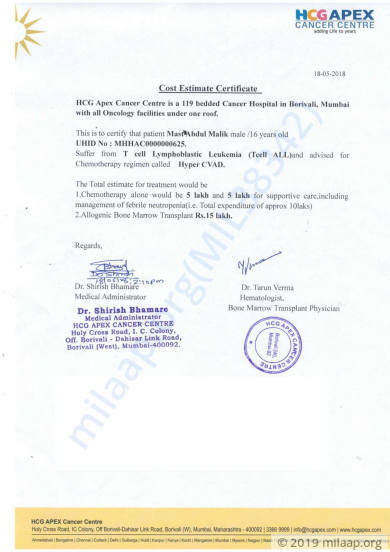 He is in no condition to arrange for the 25 lakhs required for Abdul’s bone marrow transplant. It is the only hope to save Abdul’s life before the cancer spreads any further. “All my savings are over. I have borrowed from friends and family, sold my wife’s and mother’s jewelry and even mortgaged by house. I don’t know what else to do to arrange the money for Abdul’s treatment. I can’t help but blame my financial condition as I see Abdul shedding tears and writhing in pain.” - Kareem. 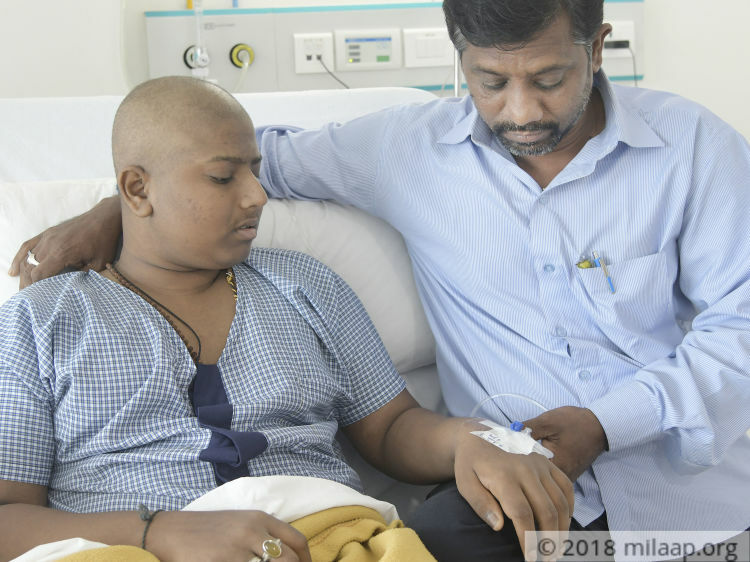 16-year-old Abdul Malik is trying very hard to fight against cancer. Despite the setbacks, Abdul still dreams of going to college and living a normal life. The only respite during his times of pain and suffering is when he thinks of getting well. But Kareem is unable to arrange funds for the bone marrow transplant which can save his son’s life. Your kind contribution can help Abdul get back to normal life and fulfill his dreams. Thank you for your love. Abdul is currently doing okay. He has been undergoing chemotherapy for now. 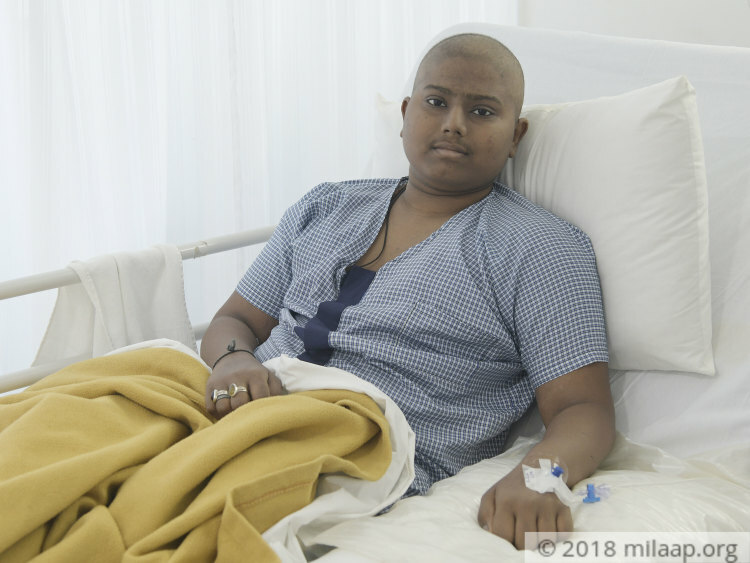 The doctors have advised a bone marrow transplant and the same shall be planned and scheduled once enough funds are raised to support his treatment. We shall keep you posted on the progress. Please keep supporting and sharing as much as possible so we can provide the best of treatment to my son. Thank you once again!